Green Tea is not expensive, and it is a great beverage to partake in. In fact, according to Healthline.com, it’s “the healthiest beverages on the planet.” Green Tea itself comes from an evergreen shrub, Camellia sinensis, originally cultivated in China and now more widespread throughout the Far East and the Middle East. The primary clinical application (medicinally) for Green Tea is as an adjunct in the prevention of both heart disease and cancer. All the body’s systems, such as the digestive tract, bloodstream, and breasts (regarding estrogen-related cancers for women) have been demonstrated to be protected with Green Tea, that contains anticancer properties in abundance. It has thermogenic and fat-oxidizing properties that can be useful for patients who are obese. It also reduces glucose and several other plasma constituents that are indicative of Type 2 Diabetes. Polyphenols are the chemicals that are responsible for the chemoprotective (protect from chemicals and poisons) and antioxidative effects of Green Tea. In past articles, I explained how free radicals worked, and I’m going to touch on it again now. Free radicals are atoms or molecules that are missing an electron. What they do is “grab” or “capture” that missing electron, “stealing” it if you will from a healthy cell. The problem is, the healthy cell is no longer healthy. Scientists and doctors believe that free radicals are responsible for a great deal of growth of cancerous cells, as well as being the primary agents responsible for aging. Green Tea is an antioxidant: it holds extra electrons, and it fights these free radicals by donating one of its extra electrons to the “Snidely Whiplash” free radical, thereby neutralizing its harmful effects. Do you get the picture? 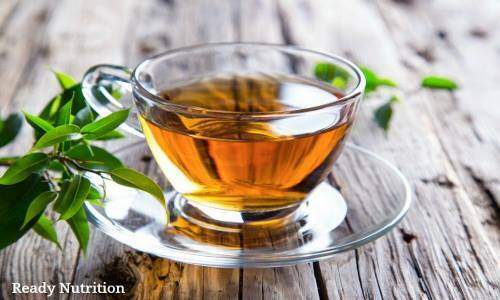 The caffeine in Green Tea is a central nervous system stimulant; however, it is not as potent as coffee. The caffeine content is about 10 to 50 mg per cup, depending on the type and quality of the tea. The polyphenols, on the other hand, range from about 80 to 100 mg per cup. Over the course of a day, four cups are about the limit with three being a normative amount. Keep in mind: people with cardiac problems should consult their friendly physician when he’s back from the golf course prior to taking green tea or acting upon information in this article. From a workout perspective, the antioxidants in Green Tea will promote recovery faster after you’ve completed exercising. Guess what? Not only is it good for the systems we just mentioned, but it’s also good for the development of the human brain. L-theanine is an amino acid that enhances the brain’s A (Alpha) waves, and it boosts a chemical produced within the brain called BDNF (Brain-Derived Neurotrophic Factor). L-theanine increases neurogenesis in the hippocampus. What this means is that it stimulates the growth of nerve cells and strengthens the connections between nerve endings and nerve cells within the human brain. This effect is also accomplished with the aid of EGCG (epigallocatechin gallate), a polyphenol and an antioxidant that helps the hippocampus and also the mitochondria…a crucial “power-supplying machine” within our cells. Green Tea is an excellent source of these things. I’m drinking some as we speak. Yeah, JJ buys it at the dollar tree, 100 bags for $1.00, but be advised: the bags are 1 g (gram) bags, and you need about 1.75 bags to have the effects of a full cup. I do this: I use a jar that holds 1 quart of water. I fill it up, put in 7 tea bags, and secure the lid. Then I set it in the sun. At the end of the day, I squeeze the bags and place the jar in the fridge. Each morning I fill up a 32-ounce Gatorade bottle with my tea, and I sip off this all-day long. So, each 32-ounce bottle is equal to 4 cups of Green Tea. I don’t sweeten it or put anything in it…just drink it straight up. Cost is not even a dime a quart, with no bad ingredients. Can’t beat that, and it’s as simple as the day is long. Mrs. JJ and I get a week out of a box. So, check into this one and you’ll really get used to the taste of it. The benefits are exceeding, and you can do it the way that I do for pennies on the dollar. The Chinese have been using it for about 5,000 years, and although there aren’t any 5,000-year-old Chinamen, their people (based on herbalism and homeopathic remedies) enjoy longer lifespans than ours. They must be doing something right, and Green Tea is a centerpiece of Chinese Herbal Medicine. Stay in that good fight! JJ out!